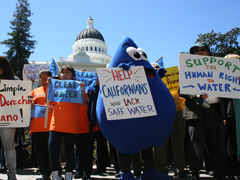 This past week, the California Assembly passed AB 685, the Human Right to Water Act. Now we're just a signature away from ensuring law and policy that will bring safe, affordable water to all Californians. What's the story behind the Human Right to Water Act? Getting this far has meant building a strong grassroots coalition with much community and member support. We hope that the history of this legislation inspires other water democracy and environmental justice activists to get going on their own version of AB 685. AB 1242, the first Human Right to Water policy bill, was part a “water bill package” introduced in early 2009. After AB 1242 made it through all Assembly and Senate Committee hearings with some amendments and was passed by the Assembly 53-24 and the Senate 23-14, then-Governor Arnold Schwarzenegger vetoed it. Schwarzenegger, however, did sign some of the other more “narrowly focused” bills in this 2009 package. After this, the Safe Water Alliance, a coalition of faith-based, tribal, environmental, health, public-policy and community advocacy groups, including Alliance for Democracy, was formed and in February 2011 introduced AB 685, the Human Right to Water, as part of an ambitious six-bill package of to ensure clean drinking water for all Californians. In early spring, Catarina de Albuquerque, the United Nations Independent Expert on the human right to water made a fact-finding mission to the United States. In California she visited several Central Valley, CA communities in an area where for too many years residents have suffered the financial and health impacts of unsafe water at home and/or in schools. In 2001, with Governor Brown in office, there was stronger opposition to AB 685 since it was anticipated he might sign this bill. The oppositions’ demands for amendments seemed meant to stop the bill and discourage the bill’s author Assembly Member Eng and Safe Water Alliance members. When it did not, and the bill made it through the Assembly in June, 2011 by 52-24, it was finally stopped by the last Senate Committee, Senate Appropriations that put the bill on the “suspense file” where bills are sent to die. 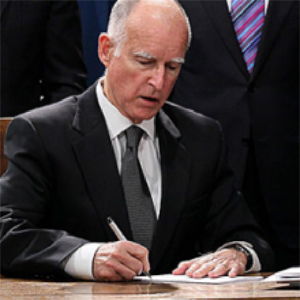 However, Governor Brown did sign several of the narrowly focused bills in the package, at the signing saying: "The bills I have signed today will help ensure that every Californian has access to clean and safe sources of water. Protecting the water we drink is an absolutely crucial duty of state government." Meanwhile, with the key policy bill, AB 685, stuck in the Senate Appropriations Committee, members of the Safe Water Alliance met to formulate and implement a strong “inside the capitol” and “outside grassroots” strategy to get the bill to the Governor’s desk. This necessitated taking amendments to clarify this was a broad policy bill to direct State Agencies and Departments when making decisions about water policy to consider the impact on the human right to health and that doing so would not impose a fiscal liability on the state, a point the opposition kept raising. Finally, at the last minute when the fate of all bills has to be decided, on August 16, the Senate Appropriations Committee voted 5-2 to send the bill to the Senate Floor. It was one of only 5 out of more than 200 bills that this Committee voted out and on August 23 it passed by 22-16. Because the bill was amended in the Senate, it has to go back to the Assembly for “concurrence.” On the morning of August 29, it passed by only 42 votes, 41 need for a majority…very close, but “every drop counts.” But by close of session that day, it had gained enough votes to pass 51-28. Defending Water for Life organizers Nancy Price and Ruth Caplan thank all the Alliance's Californian members and supporters who responded to our action alerts over the years. Taking action is what turns our education into on-the-ground victory as we build the movement for the Human Right to Water and community rights in California. Watch for the launch of our new our website, focusing on California water issues, soon!